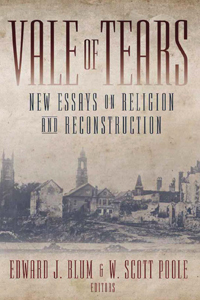 Vale of Tears: New Essays in Religion and Reconstruction offers a window into the exciting work being done by historians, social scientists, and scholars of religious studies on the epoch of Reconstruction. A time of both peril and promise, Reconstruction in America became a cauldron of transformation and change. This collection argues that religion provided the idiom and symbol, as often the very substance, of those changes. The authors of this collection examine how African Americans and white Southerners, New England Abolitionists and former Confederate soldiers, Catholics and Protestants on both sides of the Mason-Dixon line brought their sense of the sacred into collaboration and conflict. Together, these essays mark an important new departure in a still-contested period of American history. Interdisciplinary in scope and content, it promises to challenge many of the traditional parameters of Reconstruction historiography. The range of contributors to the project, including Gaines Foster and Paul Harvey, will draw a great deal of attention from Southern historians, literary scholars, and scholars of American religion.